The U.S. Conference of Catholic Bishops has rightly criticized Paul Ryan’s proposed draconian cuts to social programs that aid the poor. 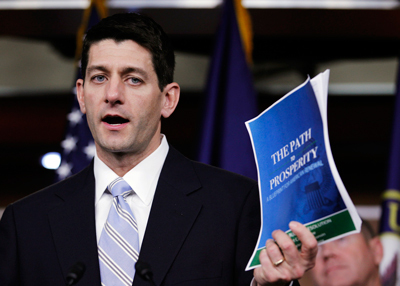 Catholic scholars rebuked Ryan for claiming that his budget reflects principles of Catholic social teaching. Ryan deserves credit for elevating Catholic social teaching to a central place in the discussion. Unfortunately, he badly misunderstands two bedrock principles of CST—solidarity and subsidiarity. He also misinterprets how these principles apply to the scourge of poverty in the United States. Ryan correctly identifies one aspect of solidarity, namely the “recognition of the common ties that unite all human beings in equal dignity,” as he puts it. However, Catholic social teaching adopted the view of Heinrich Pesch, S.J., (1854-1926) and Oswald von Nell-Breuning S.J., (1890-1991), who envisioned three aspects of solidarity: 1) solidarity as de facto human interdependence; 2) solidarity as an ethical imperative; and 3) solidarity as a principle concretized in legislative policies and institutions. By its very nature, solidarity requires advocating social change on the structural level. This is the case because eliminating the causes of the suffering of the wounded and oppressed requires embodying solidarity in social policies and institutions. In other words, solidarity includes but goes beyond charity to promote justice and human rights, particularly by empowering the marginalized. Charity is important, but never sufficient to meet the needs of the poor, as Pope Benedict reminds us in Caritas in Veritate. Christians must thus foster the common good through “the institutional path—we might also call it the political path—of charity, no less excellent and effective than the kind of charity which encounters the neighbor directly.” As John Paul II argued, the entire social, economic and political order should be shaped by the principle of solidarity. In his speech at Georgetown University, Ryan claimed that “Civil public dialogue goes to the heart of solidarity, the virtue that does not divide society into classes and groups but builds up the common good of all.” There is a grain of truth here. Solidarity does aim to allow all people to participate in and benefit from the common good. As the philosopher Fr. Józef Tischner of the Polish Solidarnosc movementargued, solidarity excludes no one. However, Pope John Paul II, who developed the concept of solidarity more than any other pope, acknowledged “the positive role of conflict” when it “takes the form of a struggle for social justice.” He also stated solidarity sometimes requires taking the side of the poor when their rights and welfare are jeopardized. Thus, solidarity does not imply “a live and let live” approach to politics; it makes demands of all of us. Solidarity does not seek to vanquish oppressors, but it always insists on the truth and challenges oppressors to see themselves for what they are, as Tischner maintained. Ryan also attempts to enfeeble solidarity by flanking it with the principle of subsidiarity. Ryan approvingly cites Pope Benedict’s claim that “… subsidiarity is the most effective antidote against any form of all-encompassing welfare state.” But Ryan fails to acknowledge the positive side of subsidiarity. When possible, it is better for smaller, local groups to solve their own problems. However, Catholic social teaching posits that larger entities, including governments, have a responsibility to assist individuals and communities when they cannot effectively solve their own problems. Those looking to the Polish pope, whom neoconservatives mistakenly dubbed unabashedly pro-capitalist, will search in vain. John Paul II contended governments should not thwart citizens’ efforts to assuage the needs of the poor. However, the state should provide support when necessary. Moreover, the state can take on the lion’s share of responsibility of providing for the rights and welfare of its citizens when intermediary groups cannot fulfill this role (Centesimus Annus, no 48). What does subsidiarity look like in the current American context? Take the case of job creation and the right to work. Private employers directly enable the fulfillment of this right by providing jobs. But the state must provide the legal, economic and social frameworks necessary for the realization of this right. As John Paul claimed, “the state has a duty to sustain business activities by creating conditions which will ensure job opportunities, by stimulating those activities where they are lacking or by supporting them in moments of crisis” (emphasis mine). The American Jobs Act, decried by Paul Ryan as excessive government, attempts to do just this. In the area of social welfare, the popes envisioned government supporting local groups and agencies and directly assisting the needy as necessary. This is exactly what the U.S. government does today. In fact, the government enables Catholic organizations (and many others) to engage in various works of mercy. Over the last two years, the government increased funding levels for this purpose, even allocating federal stimulus money to faith-based charities. In 2010 Catholic Charities alone received about $2.9 billion from the federal government, which is 62 percent of its entire budget. Lutheran Social Services of Minnesota, like most of its counterparts around the country, relied on the government for about 80 percent of its revenue. This is the principal of subsidiarity in action. The government supports those who can best provide not only material assistance, but also respond to “deeper human need,” as John Paul put it. Ryan believes that the government’s role in combatting poverty should be radically reduced, leaving the taxpayer to do as she or he pleases with her income and assets. He disregards Catholicism’s insistence on the universal destination of all goods and the duty to contribute to the common good by paying taxes in proportion to one’s ability. In Ryan’s words, “basic economics and basic morality both tell us that people have a right to keep and decide how to spend their hard-earned dollars.” The fate of the poor, in this view, should be largely left to private organizations. Can churches, synagogues, mosques and other NGO’s sufficiently rise to the task, using only charitable donations? Not according to economist Robert Reich. Only about 10 percent of all charitable contributions aid the poor, Reich says. The rest (about $40 billion in tax breaks for charitable giving) goes to maintaining religious organizations (properties, salaries, etc. ), the arts and universities (which, as I have written elsewhere, increasingly exclude the poor). Moreover, Ronald Sider demonstrates in Fixing the Moral Deficit: A Balanced Way to Balance the Budget that private initiatives provide only 6 percent of all food assistance in the United States. Replacing the federal government’s $485 billion dollar antipoverty programs would require every U.S. congregation to contribute an additional $1.5 million dollars. Sider therefore concludes that “churches should do more, but they cannot begin to replace” the federal government in addressing poverty. As Ryan acknowledged, the level of poverty today in the United States constitutes “exceptional circumstances,” to use John Paul II’s phase. The amount of need is so great—1 in 6 Americans experience poverty according to Ryan’s Georgetown speech—that charitable organizations cannot possibly meet it. In other words, ameliorating the situation requires direct government involvement, in addition to facilitating the work of organizations like Catholic Charities. Ryan provides the wrong solutions to poverty for two reasons. As I have argued, he misinterprets solidarity and subsidiarity. He also misunderstands poverty’s causes in the United States. Contrary to Ryan's contention, the causes of poverty are not rooted in an expansive government and a culture of dependency on hand-outs. Rather, it is rooted in government’s failure to perform its duties in accordance with the principles of solidarity and subsidiarity. In other words, “smaller government” caused the problem. Many people lucky enough to have steady jobs earn “poverty wages.” Seventy-five percent of the working-age adult poor have jobs. As the Economic Policy Institute reports, steady gains in productivity over several decades have translated into more wealth for stockholders, but little gain for many wage-earners. Finally, the rising U.S debt is not the cause of poverty, nor does it threaten social protections for the poor in the way Ryan contends. Economist Charles Clark has debunked this debunked this myth, calling for the virtue of truth telling to augment solidarity and subsidiarity in the discussion of the federal budget. Clark’s essay explains in more detail than possible here why the economics of Ryan’s claims are false. We should be grateful that Paul Ryan has reintroduced the concepts of solidarity and subsidiarity to our political discourse. Now we need to make sure they remain there, and that we understand and embody them in a way faithful to the Catholic tradition. I personally oppose the Ryan budget and support more anti-poverty spending on the federal level, financed by higher taxes on the middle class and up. But it is simply wrong to imply that Catholic social doctrine requires such policy positions, and stifling legitimate debate does great harm to the cause of promoting Catholic social teaching. While this is grounds for opposing social spending cuts in the middle of the current deep recession, it is hardly an endorsement of the permanently expanded social states of Europe. And Pope Benedict has echoed these cautions in his own encyclicals. So there are legitimate Catholic grounds for debate about the proper size of government. Yet, what is beyond debate is that we as a Church are failing to live out solidarity with the poor both domestically and globally. Missing from both Ryan's speech and this article is any exhortation that we take responsibility for loving the poor directly. Ryan embraces a false “morality” that says people should “spend their hard-earned dollars” however they want, while the author just makes excuses for our pitiful charitable giving. Where are the Peter Maurin's and Dorothy Day's of today to challenge us to care for the poor “at a personal sacrifice” rather than arguing about what other people should do? Seems like everyone wants to wiggle out from the obvious mandates of Matthew 25. Apparently, if poverty is judged to be in any way self-inflicted, it is excusable to ignore it. If the so-called advanced social/political/economy order prefers a widening gap between those who have and those who are in abject need, then somehow that is more important than actual justice? We are staring in the face of economic warfare, just as we do military war, drug war and increasingly, religious war. I don't think Jesus would vote for it. I wonder if Professor Beyer has ever really worked with the poor who "need "big government. From what I can tell, and I do admit to only scanning all his verbage, his ivory tower does not admit a good view of the world of the "poor'. My poor are very different one from the other. Most immigrants, both documented and undocumented, are poor but hard-working, and well deserving of LOCAL help. The mentally ill and congenitally afflicted also need help, more often at a county or sometimes a state level. THeir families often demonstrate a heroic response to their needs which leaves me in awe. However, dear professor, there are a great number of lazy folk out there, who spend their time doing drugs, eating chips and drinking alcohol. They subsist intergenerationally on the dole.I always wonder, and have questioned them about. how they can sustain a 10 dollar a day cigarette habit (and I have no idea of how much their cocaine costs) yet not be able to afford vegetables and fruits. What really fries me is how upset they get if we health care providers are 15 minutes late providing FREE care, because we are caring for another noncompliant patient who has dug himself or herself into a hole by not taking perscribed medications. I love fancy words and sophisticated philosophical arguments and Professor Beyer seems especially adept at these. But frankly they just don't fly in the real world. Big government taxes the middle class, provides employment for the otherwise unemployable, and discourages self reliance, which is the foundation of self respect. a You are just full of it . you, like the democrats just want bigger goverrnment you accuse ryan of misusing catholic doctrine ro further ideology but turn around and do it your self you quote a far left econmist that folks are incapable of helping the poor enough and simply dismiss the possiblility that govt. efforts may be making the situation worse. when there is in fact considerable evidence that govt. aid may be contributing to the breakdowm in marriage among signifigant portions of the populace. If you can't see any correlation between poverty and family breakdown you are just blind idealoges and shouldn't talk about the subject. the fact that two out of five children are born out of wedlock should be enough to alert even you idiots that there is a problem in this regard, the riots in london last year is what happens when you have a absence of families in an area. Any one who cares about children, poverty,and inequality and doesn't understand the importance of family in these matters is a poor sociologist and a poor- I started to say a poor Catholic . but I don't want to treat prudential matters as if they matters of doctrine as you constantly do in you writings. a You are just full of it . you, like the democrats just want bigger goverrnment you accuse ryan of misusing catholic doctrine ro further ideology but turn around and do it your self you quote a far left econmist that folks are incapable of helping the poor enough and simply dismiss the possiblility that govt. efforts may be making the situation worse. when there is in fact considerable evidence that govt. aid may be contributing to the breakdowm in marriage among signifigant portions of the populace. If you can't see any correlation between poverty and family breakdown you are just blind idealoges and shouldn't talk about the subject. the fact that two out of five children are born out of wedlock should be enough to alert even you idiots that there is a problem in this regard, the riots in london last year is what happens when you have a absence of families in an area. Any one who cares about children, poverty,and inequality and doesn't understand the importance of family in these matters is a poor sociologist and a poor- I started to say a poor Catholic . but I don't want to treat prudential matters as if they matters of doctrine as you constantly do in you writings. the important thing to know is that no pogress can be made in reducing poverty without the restoration of family among the poor, none! Regina; let me add something to your remark: "...there are a great number of lazy folk out there, who spend their time doing drugs, eating chips and drinking alcohol." I agree with you if you mean that there are a great number of people out there who have inherited a self-distructive "culture" of poverty and appear to us (who don't have such a culture) as "lazy" folk. I would disagree with you if you mean that the poor have only themsleves to blame for their povery. Leaving aside the few willfully lazy (rich and poor) for a moment, there are without doubt cultures of poverty and dispair, e.g.,within our Indian Reservations, where a dominate culture destroyed and dehumanized another group such that there was little left upon which to build success as we think of it in the white western world. A strong argument can be made that African-American slavery only ended in a significant way when the Federal government ended segregation and Jim Crow in the 1960's. Looked at with that time line, it is amazing how many African-Americans have been able to pull themselves out of povery in such a short time. So, there is partial truth in the conservative argument that just funding transfer programs for the poor reaches a point of diminishing returns. The late Senator Daniel Patrick Moynihan argued for many years that we needed to go further and break the self-destrutive culture that perpetuates poverty-a much more complex task than merely tossing tax dollars and folks who find themselves at the bottom. However, a difficult and seemingly intractible task is not an argument for not doing it at all-the Ryan, et al formula. We are called to be better than that. How is a national government policy that creates an underclass of depencdency beneficial to those who are the target of such programs? How it the forced taxation to pay for such harmful programs "Christian"? How is a central government that strives to provide equal income for all through a progressive tax structure moral or just or even desireable? Paul Ryan has it exactly right - Federal Programs by and large are abysmal failures because they are incapable of dealing with local differences. Moreover, they encourage waste, treat the poor like case files and take resources away from the private sector which could be better spent creating wealth. I offer as an example LBJ's great War on Poverty; The Federal answer to the housing problem, HUD and now Fannie and Freddie; How about the War on Drugs that is funded and carried out based on the directives of some or several Federal agencies. I'm sorry. For all of their good intentions, the beaurocrats in Washington will never be able to eradicate "poverty" (however they choose to define it this year). That is because their central planning cannot anticipate all of the differences among the 330 million citixens and thousands of towns, villages, cities and neighborhoods it tries to control. What a central beaucracy can do is remove resources from those people and locales, spend 20% of those resources in Washinton DC (Have you been there lately? There has been no recession within the Beltway that I could see.) Christ left it to his followers to indivicually make a difference and to form communities who would care for the poor - He didn't say let the government do it. Paying one's taxes to fund entitlement programs is not charity. It is not an act of love. It is not what Chirst told us to do in His Sermon on the Mount. Why don't we allow citizens to keep their money and give it to thier Church's anti-poverty programs? Those programs have proven to be far more efficient at addressing the needs of the poor than Aid to Dependent Children or other such government failures. I have seen the City of Detroit destroyed by government programs (all of which originate in Washington which gives tax dollars back to cities who demonstrate a need and implement their programs) I recently represented a Detroiter with mental illness who traded in his bridge card (used to be called food stamps) for a cornucopia of drugs. Another example of a government program gone awry. No, I do not feel that our Church needs to support bigger federal government programs for helping the poor. That's not what a government is supposed to do. Although the poor will always be with us, what they need is to be treated as responsible adults, not government wards. Let the government stick to what it was set up to do: Defend our borders: Promote international trade; Administer a legal system; Provide a national treasury to facilitate commerce (not a Federal Reserve). Helping the poor is the work of the family, the church, the local citizenry. Wealth redistribution (socialism) doesn't work. It is immoral. It creates a divisive society. And results ultimately in a dictatorship. Professor Beyer, solidarity, the free association of persons for the common good, is a great ideal and works quite well outside of government. But when the power of the Federal government directs where one's resources are to be directed, the element of free association is eliminated. Our God given gift of free will, individual liberty, is too precious to be relinquished to a central political authority. I find it interesting that in matters of pelvic morality - issues dealing with sexuality and reproduction, as well as end of life - there is a segment of the Catholic population, I will call it the Catholic right, for lack of a better term, that demands strict adherence to papal documents, stated doctrine, and the Catechism. Yet this very same group will turn around and allow a myriad of interpretations of basic principles of Catholic social teaching such as solidarity and subsidiarity. Prof. Beyer has carefully laid out the most recent examples in our tradition from within papal teaching where these principles are defined, described, and some applications suggested. And yet for some, a commitment to a capitalist reading of these terms aligns some of the respondents here with Ryan's interpretation of these principles, a clear deviation from how they have been officially laid out. The principle of subsidiarity requires that whatever system of government that exists - small or large - be sufficient to insure the participation of all its citizens in the common good as well as in the decisionmaking processes that insure access, participation and contribution to said common good. When deep economic inequality arises - such as the statistics shared by Prof. Beyer of 4% of the U.S. population living on $2/day (a metric heretofore only used to report living standards in developing countries) - participation and access are strongly, if not absolutely, compromised. In turn, this break in the fabric of our democracy begins to corrupt other matters of access and participation, not just for the very poor, but for middle class citizens as well. The Occupy Movement witnessed to this sentiment across various social groups. Mr. Ryan's articulation of these two key principles of Catholic social thought fails to encompass the complex and robust relationship between state and citizenry envisioned in the tradition. Therefore it inadequately guides the faithful in determining possible applications of these principles that could actually effect real transformation in how the very poor and other groups in our country are able to be represented and participate in the very processes that determine our destiny. One final addition to Prof. Beyer's comments with regard to the principle of solidarity. In Christian tradition the deepest act of solidarity is that of the Creator taking on our humanity to suffer with us our deepest poverty - violent human death. Therefore, the struggle for just economic and political systems that this principle demands imply that all will share in the burdens of those most vulnerable among us, as a practice of the immitation of Christ. In other words, for Christians solidarity must include a bearing with one another, to some extent taking on the suffering of the other. How one advocates for policy based on this principle in a society and culture that privileges profitmaking, acquisitiveness, and individualism is one of our biggest challenges. Perhaps more fruitful discussions could be how one preaches the principles of CST in our churches, such that our faithful can engage our political processes accordingly. A great great article! Thank you! What Ryan did NOT miss in his critical and unique role as a responsible Chairmen of the House Budget Committee is the United States now has a 16 trillion dollar federal debt which contitues to grow by one and a half trillion each year for the last three years and indefinitely into the future. The United States continues to barrow each year over forty cents of every dollar of expenditure. A 16 trillion dollars federal debt is larger the annual Gross Domestic Product of all goods and services produced in the United States. The United States indebtness is more tha 100% of GDP a proportion that can not be sustained and has numerous extreme consquences including the United States government and the total collapse of United States economy. Several nations of Europe are now unable to finance themselves which has lead to drastic cut backs of all governement expenditures inclduing salary, pensions, public assistance. Paul ?? ?Ryan ?c?o?r?r?e?c?t?l?y? ?r?e?c?o???g?n?i?z?e?s??? ????a???n???d????? ???????????????????????????????d?e?a?l?s? ?w?i?t?h??????????????????????????????????????????????????????????????????????????????????????????????????????? ?????r?u?n???a?w?a?y? U?n?i?t?e?d? ??S?t?a?t?e?s? ???g???o???v???e?????r???n????m?e?n???t???? ?f?i??n?a?n?c?i?n?g??.???????????????????????????????????????????????????????????????????????????????????????????????????????????????????????????????????????????????????????????????????????????????????????????????????????????????????????????????????????????????????????????????????????????????????????????????????????????????????????????????????????????????????????????????????????????????????????????????????????????????????????????????????????????????????????????????????????????????????????????????????????????????????????????????????????????????????????????????????????????????????????????????????????????? Paul Ryan correctly recognizes and deals with the urgent and immeadiate crisis of our out of control U.S. government financing that threatens the economic, political and social collapse of our entire nation. I waited a long time to see the Catholic push back against the Ryan budget. It will leave the elderly improvished as in the past (before Medicade and Medicare). The Corporal Works of Mercy do not instruct us to have a 'worthiness' test before carrying out these duties. We are becoming a society in which the attitude of 'I have mine, now you get yours' is acceptable apparently. When I help someone who is ill, homeless, needy is it my ego that requires them to be 'worthy' or do I do so as Christ did-out of love? Why must the least financially able bear the austerity while the wealthy continue to worry about their taxes and where to offshore their accounts? Did I just wake up in the Papal States of America? The US government, before it was taken over by the Vatican, is by law obligated to govern without Church oversight, and without interfering in Church matters. When I read that Ryan's budget doesn't match the Catholic Social Teachings, well, which budget did before his proposal? Are we Catholics obligated to vote the Democratic party? Nope. We are obligated to be good to the poor. We are not obligated to organize the government along those same lines. Taxation is coercion, necessary but limited in scope and effect according to resources; charity is gift, necessary and graceful, and also limited by resources. There is nothing virtuous about a 51 percent tax rate that diminishes my ability to provide for my family. State, federal, local, sales, and excise taxes easily add up to confiscate a majority of earnings. And still the goverment is reckless, borrowing above revenue, and ability to repay. There is nothing good in that, or Catholic about being insolvent. An insolvent goverment can not help the poor or anyone. Ryan's budget attempts to put fiscal reality back into the contentious debate in Washingion. It's a serious attempt long ignored by both parties. Catholics who think that only a liberal US government fulfills dreams of social justice are deluded. Mr. Ryan knows better and is at least trying. I already lost my career after 40 years. At 62 I am working in a place 1,000 miles from my home making a third of what I made before. I am one of your public employees you hate so much. I'd wager that all of you who Paul Ryan fans have good paying jobs or your sitting pretty on your retirement fund. It's pretty easy to assume that all the people in need of government help are leeches living off your taxes under those circumstances. Anyway I hope you get your wish. I hope Romney wins. I hope Ryan's budget plan gets past. I hope you give bigger tax breaks to all the 1%ers. My life is already ruined, I'd love your company. Over half the poor in the U.S. are seniors and children under the age of 18. Of the remaining working-age adults, more than half again are among the working poor or mentally ill and disabled. So, many assumptions by some of those above about all the poor being lazy are simply not true. However, for Catholics, it doesn't matter whether poverty is caused by laziness or any other personal failure of the poor themselves. Our responsibility to address the needs of the poor isn't conditional on what they do. The Beatitudes contain no caveats, conditions or provisos that relieve us from our obligation to serve the poor. Poverty, vulnerability and other forms of hardship create obstacles to hearing and living the Word of God. So our work on behalf of the poor is a necessary work of salvation for us and for them. What's fortunate and what remains a source of confusion is that, since the Great Society programs of the late-1960s, poverty in America is qualitatively and (until recently) quantitatively different than it was before. Although stressful and degrading, poverty is not nearly as grinding or life-threatening as it was before. Given the success of these programs, tt's easier for people with no hisorical perspective to associate poverty with a state of ease and to negate the real good these programs have done. We definitely need to find better ways to address poverty and encourage self-reliance, but cutting the budget for these important social programs without any realistic alternative is simply immoral. We are obligated to find solutions to these problems. Subsidiarity doesn't make sense except as a guidance for how these problems get solved. Using subsidiarity as an excuse not to do anything (or as simply a personal ethic of charity that ignores the impact on the needy) is perverse. All the Ayn Rand inspired rugged individualists commenting on this thread ignore so much of the realities of the vast majority of people on this planet who are poor. 80% of our brothers and sisters on planet earth live on less than $10 a day. - According to the U.S. Government, the poverty line is $22,314 for a family of four. One keystone of Catholic Social teaching is the idea of a living wage, that is a wage that can support a family. Our society, community, government, culture (call it what you want) accepts the idea of $7.25 an hour as the minimum wage. Working 40 hours a week (if you can get 40 hours a week) for fifty weeks = 2000 hours a year. At $7.25 an hour, that's $14,500 a year. Can any of you rugged individualist's support your family on $7.25 an hour? Any company you know want to pay workers $15 an hour out of the goodness of the company's "heart"? Pay people what they are worth and all this denouncing of the poor would be unnecessary. Poverty is a result of decisions made by corporate boards to pay people much less than they deserve, and then pay CEOs way more than the CEOs merit. Of course the stockholders, who "work so hard" inheriting their parents' and grandparents' wealth, get the lion's share of the profits. I've lived many years in neighborhoods filled with poor people. Mostly women and children, these folks try and survive conditions most upper middle class American couldn't survive for more than a week. The "drug using, lazy, poor" are as prevelant in college dorms as they are in any poverty stricken neighborhood, but no Paul Ryan/Ayn Rand disciple sees all the money made off college kids' abuse of drugs and alcohol as violation of Catholic Social Teaching. After all, Budweiser and Jim Beam are good, capitalist enterprises. Their corporate needs and desires trump Gospel values. We sacrifice our young on the altars of booze and pills and pretend the producers and marketers of such products are blameless. Bottom line: Beyer is right. Ryan is Wrong. If God really did favor a top-down approach to poverty reduction, why wouldn't He establish a government with the power to wipe away poverty on demand instead of leaving things to chance and the possibility that someone like Mr. Ryan would come along and mess up His plans? Perhaps we dehumanize the poor when we treat them as nothing more than problems to be solved, and we dehumanize the rich when we treat them as wallets to be picked. Wealth and poverty are catalysts for bringing the rich and the poor together in community, and community is the hallmark of the church's mission on Earth. Government is not community. Government is one of community's tools, a coercive one we use when it is necessary to force people to behave in ways they would not otherwise behave voluntarily. But that word "voluntarily" is key. Charity can only be charity when it is voluntary. Coerced acts, no matter how beneficial or well-intentioned, cannot be moral. If we force people to give to the poor, we have stripped away the moral component, reducing charity to mere income redistribution. And if one really is as good as the other, the Soviets demonstrated long ago that it can be done far more efficiently without the trappings of church and religion. All people have the moral obligation to care for those who are less fortunate. But replacing morality with legality is the first step in replacing church, religion and conscience with government, politics and majority vote. Coercing people to feed the poor simply substitutes moral poverty for material poverty. Before we can evaluate whether or not the Ryan budget is in accordance with Christian teachings we have to take a quick look at what the Ryan budget actually does it. The Ryan budget makes drastic cuts in Medicaid, Medicare, food stamps, Pell grants, Medicare and many other programs designed to help the middle and lower income people. The Ryan plan increases military spending and gives further tax breaks to the wealthiest few. Those tax cuts are so deep that the Congressional Budget Office says the Ryan budget why actually increase the deficit by 10%. That's right. For all the talk about deficit reduction Ryan plan actually increases the deficit by 10%. It's difficult to see how this budget can be reconciled with Christian teaching but apparently some have tried. The first argument for cutting social services and shredding the social safety net is that this net encourages “a culture of dependency.” The far right would have us believe that there are millions of people living off the public dole with no intention of working. While it is true there are some in this category, the real problem today is that of the working poor. In my own experience my son-in-law lost his job as a machinist a little over two years ago. This company was put out of business by foreign competition. He spent 18 months in a job retraining program learning to be a computer specialist. During that time he and his wife and their four children were dependent upon food stamps, the generosity of local churches, private charity and low income health insurance. If the Ryan plan had been in effect he would not have had the opportunity for job retraining and there is no way private charity could have made up for the loss in income and the need for health insurance. They would have lost their house and there is no way I have the resources or the space to care for six more people. Our would have taken in one or perhaps two of the children but the family would've been broken up. He is not alone. There are millions exactly like him. Incidentally, he passed the job training program but the only job he could find was one paying $15 an hour with no health insurance. Luckily, he did find another job as a machinist but health insurance is so high he cannot afford it. A second argument put forth is that we should encourage private charity. This is described as a “more moral” concept depending on free giving and not government coercion. This ignores the fact there is a huge difference between what people SHOULD do and what people WILL do. We all agree that people should not steal from one another, so instead of paying for Police Department should we simply preach a doctrine of moral goodness and hope for the best? In fact, this idea is a recipe for disaster. The average person would hardly give enough to support needed social programs. And many would give nothing. The health insurance alone for my daughter and her husband would be $1500 a month with nearly a $3000 deductible, if they could afford it. Is private charity going to cover this and all the other living expenses they encountered? And finally I would respond to those who complain it is “government coercion.” Yes it is government coercion but is not the government carrying out the will of the people as expressed through their ballots? And more to the point, I would ask those who object to this “coercion”on behalf of the working poor, and those who object of the so-called coercion in the health care bill, if they also object to the “coercion” of being forced to pay for huge military budget and for intervention in wars which they object to on grounds of conscience? So far I have not seen any Christian conservatives complaining about this form of coercion. In short, in my opinion, it is difficult and nearly impossible to reconcile the Ryan budget, which glorifies greed and a Darwinian view of society, with Christian doctrine in the 21st century. It is little more than a budget that tramples down the middle class and the poor while giving more to the richest few and more for the military. Don't take my word for it, don't take Ryan's word for it and you don't have to take the word of his mother either. These are all fact well-documented by the Congressional Budget Office. And one final word. Congressman Ryan has repeatedly referred to Ayn Rand as his favorite philosopher. How totally hypocritical is it of the far right to say nothing about this! Can any of us imagine what they would have to say if Pres. Obama publicly stated his favorite philosopher was a Russian atheist? My goodness! America certainly causes the juices to run and the fur to fly ... In the same issue, we are offered "What Ryan Missed" and a book review on "The Jewish Annotated New Testament!" The first, clearly bringing out (in Comments) the unfortunate divisiveness between Catholics (conservative and progressive); the second, a joyful (to me) unexpected (to me) and welcome (to me) openng of understanding and hopeful healing of Catholics and Jews.However, my initial response was to Regina. The real people left behind... and out ... in this rather bitter economic debate in these pages and in the public discussion are our millions of poor Blacks, as well as our native Indians. No great study has been made to understand the generational ennui of either group with the inevitable drinking, the abandonment of both by the Government, nor has a plan been made to break the CYCLE of poverty that has befall these two great peoples. @Mr. Lawrence, Ayn Rand was an American atheist of Russian heritage, not quite the same as a Russian atheist. @Fr. Malloy, Yes, Jim Beam and Budweiser are blameless for alcohol abuse. The abuse is gluttonous and sinful. Both advertise for responsible drinking. Would you abolish these firms? What would satisfy the dreamy needs of Catholic Social Teaching? Abolish all the firms whose products can be abused? Really? That's quite a list of everyday products. But scolds are everywhere these days, in both political parties and pulpits. Enough! There are no US Budgets that comport with Catholic teaching from either party. Thank God. Obviously you mean classical liberals like Ronald Reagan type. Not the pro-baby killing Obama type. Of course, you would agree one cannot be a good Catholic and support the most pro-abortion president in history. Lyndon Johnson's Great Scoiety was the largest poverty reduction program ever created. And it failed miserably. Just confiscating people's wealth at the point of a gun-which Mr. Beyer seems to support-and handing it out to other people does nothing to eradicate structural poverty. Only economic growth can do that. Economic growth is achieved by minimizing government interference in the economy. Have you liberals taken a look around lately? We've had four years of trying it your way. Obama-style socialism has failed miserably. We've had massive government hand-outs and still the economy stinks. OK, I know a lot of those hand-outs went to Obama's crony's to finance failing solar companies and whatnot, but still. Please give it a rest, libs. Think about the children. This article also appeared in print, under the headline "What Ryan Missed," in the June 4, 2012 issue.